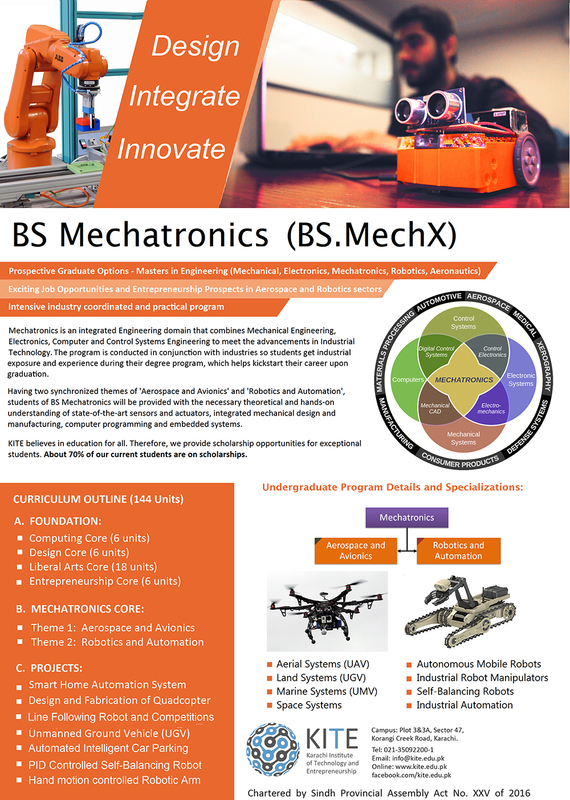 BS Mechatronics (BS MechX) is an integrated Engineering degree program that combines Mechanical Engineering, Electronics, Computer and Control Systems Engineering to meet the 4th industrial revolution movement and its technological advancements. The program is conducted in conjunction with industries so students get real-world exposure and experience during their degree program, which helps kick-start their career upon graduation. The courses within BS MechX are mostly project-oriented that enable students to gain practical understanding of each topic that they study. The students-to-instructor ratio is minimized for all Engineering courses that let students gain the required amount of attention and also provide them the flexibility to explore, share, and implement their own project ideas. BS MechX offers two synchronized streams: ‘Aerospace and Avionics’ and ‘Robotics and Automation’. For either stream that they choose, students will be provided with the necessary theoretical and hands-on understanding of the state-of-the-art sensors and actuators, integrated mechanical design and manufacturing, computer programming and embedded systems, allowing them to make a fully-functional autonomous drone or an autonomous robotic system as their final year project. This course aims to familiarize first year Mechatronics Engineering students with their discipline; provide them an overview of the courses within this program, the integration of Electronics, Mechanical Design and Computing, and the real-world applications of Mechatronics projects and on-going researches. Students will also get the flavor of the branches of Mechatronics Engineering with the options of streams that they can choose; and potential job/career opportunities once they graduate. To provide students with the fundamental knowledge of Electronics and electrical circuits. To allow students gain in-depth theoretical and hands-on understanding of current and voltages in circuits using Ohm’s Law and basic circuit analysis.To familiarize students with essential electronic components, their purpose, operation and usage, to enable them to make their own practical circuits on breadboard and veroboard. This course aims to develop English writing skills in students, with most focus on Grammar, Essay writing (persuasive, analytical, expository, narrative) and prepare them for a SAT-level Comprehension questions. Instill fluency with the basic Mathematical techniques of Calculus & Analytical Geometry which are needed as tools for engineers. Revise, and teach afresh where necessary, about functions, limits and continuity, differential, integral calculus and coordinates systems which are necessary for the engineering courses. Introduce new Mathematical topics/techniques, which are necessary for these courses. Place emphasis throughout upon the grasp of essentials and competency in manipulation. Topics include: Functions, Limits and continuity, Differentiation, Application of differentiation including related rates, increasing and decreasing functions, Maxima and minima and optimization problems, Maclaurin’s and Taylor’s series, In-determinant forms and L - Hospital’s Rule, Partial differentiation , Integration, Techniques of integration, Properties of definite integrals, Applications of the definite integral, Multiple integrals. Rectangular Coordinates, Polar Coordinates, Equation for a line in polar coordinates, Cylinderical polar coordinates and Spherical polar coordinates, Conic section. Vectors as displacements of space. Addition, subtraction, multiplication by a scalar. Position vector. Cartesian basis, co-ordinates. Scalar product. Vector product. Triple products. Applications throughout geometry especially lines and plane. The objective of this course is to strengthen the foundations of knowledge and concepts of Physics in students. The topics for Engineering Physics 1 include: Measurements, Vectors & Coordinate Systems, One Dimensional Motion, Motion in Two Dimensions, Newton’s Laws of Motion, Forces of Friction, Forces of Friction (contd), Circular Motion & Newton’s Laws Applications, Work, Kinetic Energy, Potential Energy, Energy Conservation, Linear Momentum and Collisions, Rotation of Rigid Objects about a fixed axis. Torque, Energy, Rolling, Angular Momentum, Equilibrium, Elasticity, Universal Gravitation, Fluid Mechanics, Oscillatory Motion, Wave Motion. Familiarize students with the basics of structured and functional programming with the help of graphical output. Develop algorithmic thinking and troubleshooting skills in students so that they can write basic codes and understand and modify an existing programming script based on the requirements. Consider a hospital software system with objects such as doctors, patients and rooms. Code organized in terms of objects therefore represents a more accurate picture of the real world, and becomes easier to manage and write. Topics include writing programs with objects and classes using Java. We would also learn how to make class diagrams using UML (Unified Modeling Language), which is used to build a mode of our code before we start coding. The aim of this course is to introduce theorems of single variable calculus having generality and geometric explanations. After completion of this course, students should be able to (1) Understand and compute key properties of a multivariable function – its maximum/minimum points, its rate of change at a given point. The volume under a multivariable graph including using change-of-variable theorem (2) Apply these properties in problems of optimization. The course includes Electricity, Electromagnetism, Polarization and Speed of light, EM Spectrum, Reflection & Refraction, Geometrical optics of spherical mirrors and refracting surfaces, Fiber Optics, Simple Harmonic motion, Waves in elastic media (Strings and acoustical pipes) General solutions to the wave equation, Geometrical optics of spherical mirrors and refracting surfaces, thick and thin lenses, Optical instruments, Mechanical properties of materials. This course aims to develop a strong platform for an engineering student to absorb all upcoming engineering applications related to force application and their response in solid bodies in daily life, being at rest or in motion with no acceleration. The student will become able enough to consult another engineer using standard engineering terminology employed all over the world. Topics will include: Vector description of forces and moments, Classification and equivalence of force systems, Two and three- dimensional equilibrium of particles and rigid bodies, Elements of structures – trusses, frames, friction, etc. The course aims at equipping the students with the knowledge and skills that will enable them to have an in-depth study of the religion and civilization of Islam, and enhance their understanding of other major religions by discussing their basic teachings and providing a historical overview of their practices. Also, the course would focus on the transformative role of religion in the societies, discuss the role of religious movements in this context, encourage a study of the challenges being faced by the contemporary Muslim societies in particular and explain as to how to deal with such challenges. The course, as such, aims at bringing the students in contact with the classics of Islamic studies, history, and culture, enabling them to compare and contrast it with other major religions, inducing them to adopt a rational and scientific approach in discussing the impact of religion on contemporary Muslim societies in particular. To familiarize the students with the old and new techniques in the field of Bench Fitting, woodworking, electrical work, manufacturing of metal parts by using conventional and CNC machines. This is completely Lab-based course with no final examination. Assessment will include Lab Tests and Group Projects. This course will cover the basic Mathematical techniques of Ordinary and Partial Differential Equations which are needed as tools for engineers Matrix algebra, Linear systems of equations, Determinants, Cramer’s Rule, Eigen values, Eigenvectors, Symmetric, Skew Symmetric and Orthogonal matrices, Hermitian, Skew Hermitian and Unitarymatrices. Solution of differential equations by various methods and their applications, higher order differentialequations with engineering applications, Series Solution of Differential Equations, Laplace Transformation. This course is aimed at developing an engineer’s insight to realize engineering applications associated to dynamics and motion of components in solid bodies seen in daily life. Students will be able to communicate with engineers in the standard engineering jargon employed all over the world. Student will be able to gain sufficient knowledge of Kinematics of Particles for Force, Acceleration, Work, Energy, Impulse, Momentum, etc. This shared core-course introduces students to the industry-standard tools of publication and digital media design. 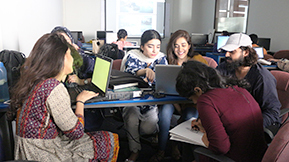 Students will implement production workflows, make layouts, edit images and create a portfolio of projects that can be built upon in subsequent courses. The objective is for the student to achieve confidence when designing materials for publication and marketing support. Students will use new media terminology and learn to for design for the publication and online media. The vision for this course is to support the visual identity, branding and product design aesthetic objectives of entrepreneurs, who can design their own prototypes, marketing, advertising and social media materials. Fundamentals of solid modeling (3D CAD) with Professional Engineering 3D CAD softwares. Theoretical overview of fundamentals of wire frame, solid and assembly modeling. Use of CAD software for developing 3D models of machine components. Students will understand how the interaction of people, ideas and institutions is central to shaping the outcomes of political processes and government decision-making at global, national, and local levels. Students will be expected to take the study of politics to developing knowledge and understanding of the relations between government and society. Exploring those issues gives a central place to questions of political order and decision making. Students will relate the power at international, national, provincial and local level. Discover how social, environmental, economic, and political and justice issues are addressed in Pakistan and on global scale. There will be the value of ‘good governance’ — what it means, and how social justice, democracy, citizenship and human rights fit (or not) into the equation. Students will learn about how issues of social welfare, social and criminal justice have made the tasks of governance more complex in the 21st century. The course will train students to think critically and independently about these issues and to develop the range of skills that will support their intellectual, vocational and personal development. This course is designed in such a way that after the students have gained basic programming knowledge and basic electronics experience, they will now learn basic implementation of sensors and actuators using Arduino and Raspberry Pi microcontrollers to create meaningful IoT projects. This course strengthens students’ skills of Essay writing with Grammar and Comprehension. This is a continuation to English 1 course, but will also cover Comprehension reading, skimming and scanning techniques in detail with extensive practice. The course is designed familiarize the students with various engineering measurement and sensing techniques that could be utilized in engineering measurements. These measurement techniques enable engineers to perform successful experiments and at the same time they are able to estimate the accuracy of their measurements. Students also gain in depth knowledge on understanding the type of errors (in measurements) and techniques to eliminate or reduce them. familiarize with different categories of engineering materials and their possible applications. acquire knowledge related to the microstructure of engineering materials. understand atomic and micro level structure of materials and properties associated with it. To develop fundamental concepts of Thermodynamics including: Laws of Thermodynamics, Thermodynamic processes and cycles (Carnot and Rankine), Heat and work, Internal energy, Enthalpy, Equations of state, Pure substances, Phase diagram, Thermodynamic processes relationships, Steady state and steady flow process, Energy equation and steady flow devices,, Reversible and irreversible processes, entropy, efficiencies. Students will also gain knowledge on the applications of Thermodynamics concepts in real-life during their lectures. The objective of this course is to impart introductory and applied knowledge about Solution Chemistry, Electrochemistry, Corrosion, Thermochemistry, Fuels & Combustion, Polymers and Chemistry of Engineering Materials. The course is designed to provide strong foundation of Fluid Mechanics and prepare them for the Fluid Mechanics Stream taught at KITE for BSME students, which includes Advanced Fluid Mechanics, Computational Fluid Dynamics (CFD), Aerodynamics and Gas Dynamics. Primary topics for this course are: Fluid Statics, Types of Flow, Basic equations and their applications, Incompressible flow, Flow through pipes & ducts, Flow through open channels. This course will first review the persuasive, analytical, and expository essay skills learnt in English 1 and 2. The main focus of this course will be on ‘debate’ with writing and delivering skills. This is KITE’s signature entrepreneurship core course, which teaches students the art and craft needed to become an entrepreneurial leader. The aim of this course is to focus on entrepreneurial leadership, which goes far and beyond just forming start-up ventures. Experiential learning, case studies, student activities, games and guest speaker sessions are the teaching methodologies of this course. The students are taught on how to think and act entrepreneurially by applying newly researched theories of entrepreneurship. They are taught on how to develop an understanding of one-self and the society / community around them through a process based approach and how they can leverage on that understanding to create and innovate something of value which can be socially, environmentally and economically viable and sustainable. The course is designed with the objectives of acquainting the students with the anthropological study of Pakistan. Advents of Muslim in India, two nation theory and the history of freedom movement with role of important leaders before and after independence and their contributions. After completing the course students are expected to learn the background and the events responsible for the creation of Pakistan. This course is to create a feeling of love and importance of Pakistan among the young generation. They will make themselves aware of Pakistan in relation to neighbors and realize their personal identification as a Pakistani national. This course has been designed to introduce students to be able to create and edit videos that can promote their products, services and startup through social media, websites and videos that can be embedded in presentations. Students will also learn how to work with social media and upload their content online for potential monetization (through youtube.com) at a later stage. This will include taking video content from smartphones as well as DSLR and professional cameras. Students are expected to shoot video on their own as they will work with video effects, sound editing, replacement, mixing and basic animation. Students learn what motivates the restive Muslim youth from Tunis to Tehran, what political positions Islamists from Mali to Chechnya are fighting for, where the seeming obsession with Islamic law comes from, where the secularists have vanished to, and whether it makes sense to speak of an Islamic state. The course is designed to provide an adequate knowledge to students needed to analyze and design various engineering components based on correct engineering methodology. Basic criteria of design of machine parts, determination of permissible and actual stresses, factor of safety, design of keys, cotters, and couplings, Design of brakes and clutches, flywheel, Design of welded, riveted and bolted joints, Design of translation screws, Design codes and standards, tolerances, standards of fits & tolerances. Kinematics, force analysis and design of spur, helical, bevel & worm gears, design of rolling contact bearings, design of mechanical springs, design of belts, ropes and chains, design of shafts. The course is designed to provide basic understanding of the feedback control systems with which everyone comes across in daily life. The course also includes the study of instrumentation needed to measure and analyze levels of vibrations. It is expected that after this course students will attain a level of understanding of the subject that will help them in their practical life. The topics will include Open-loop and Closed-loop Control systems, block diagrams, their mathematical modeling, stability assessment and criteria, stabilizing an unstable system, PID controllers and its applications. This course covers the study of technical and business writing and covers the various stages of writing, and patterns of organization. 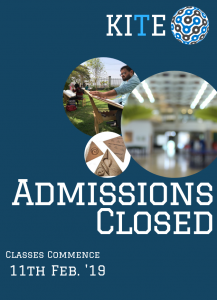 In addition, students learn to write essays for university admissions, create a resume, prepare for interview, and write formal letters and memos. They also learn research methodology, how to write technical engineering reports, and prepare proposals for grants for research projects. 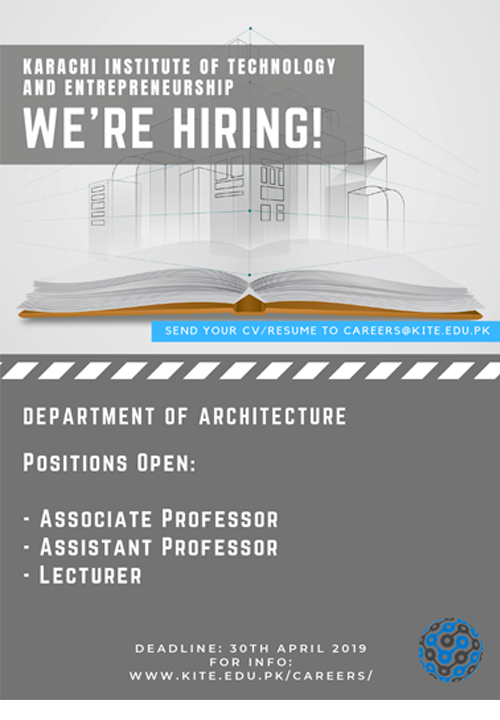 This course will be taught in the final semester and these skills will help KITE’s fresh graduates standout with their technical reports and persuasive writing abilities. This course teaches the students on how to make an effective, concise and powerful pitch to potential investors, co-founders, partners etc. In this highly competitive market, you normally get one shot at the potential investor or a group to describe your project or idea with passion. On top of it, you are supposed to present in front of people who are used to meet people like you day in and day out. So it takes special art and practice to make yourself and your project stand out from the crowd in 5 – 10 minutes of your pitch. This requires serious skills and practice, which this course aims to focus on. The art of mixing storytelling, humor, emotions etc in your pitch are also part of this course. The objective of this course is to enable the use of probability theory to analyze data for decision-making and for the solution of problems in engineering, and computer research work. The students will be able to evaluate the probabilities associated with outcomes obeyed by mathematical principles. This course is about the financial aspects of decisions related to engineering projects. A principal activity of an engineer is to propose solutions for the problem posed for a project and selects the best among the alternatives. However each project development requires strong financial evaluation, scheduling, and risk assessments and project management. Hence, this course deals with estimating the financial impacts of a project especially with regard to the cash flows provided by receipts and expenditures over time. Students are familiarized on how a cash flow can be expressed as a single equivalent measure and evaluated as to its financial acceptability. The aim of this course is: To introduce students to fundamentals of Industrial Automation. Familiarize students to sensors and actuators used in industries. Familiarize students to controllers and drives for industrial automation. Expose students to various automation design problem in industries. Expose students to the practical aspects of PLC, Process Control and CNC Machines. This course enables students to learn about the principles, theories and practices of marketing. Apart from learning about the traditional marketing theories, students learn experientially about testing their ideas / products / venture in the context of effectuation theory of entrepreneurship. Students will be taught on how they can market their product through cost effective means such as social media. This course is fast-paced, hands-on and interactive. It has been designed to focus on “learning by doing” rather than “learning by listening”.